I decided to make curry udon today, which is a great alternative to curry rice. To make it extra special, I used a stone pot instead of a regular bowl. I admit, I was inspired by the stone pot curry udon at Curry House restaurants. I used the same basic ingredients I would for curry rice. First, make the dashi stock. Soak some kombu in 4 cups of water for about 20 minutes. After letting it soak, turn the heat on and boil the water. When water starts boiling, take out the kombu and put a handful of katsuobushi. Let it boil for couple of minutes and turn off the heat. Once katsuobushi sinks to the bottom, use colander lined with paper towel to strain the stock. Then you are left with dashi stock. If this process is too cumbersome, Asian markets have packaged dashi packs that you can just put in water and boil. I didn't use those today, but I think it's a great option. Once I strained the stock, I was left with about 3 1/2 cups of stock. Now you're ready to make curry. Using a deep pan, cook onion in 1 tablespoon of butter. After 5-10 minutes, add a little oil and cook the meat. Once the meat starts to cook through, add the rest of the vegetables. By the way, vegetables can be whatever you have in the refrigerator. Mushrooms, squash, broccoli, tofu, options are endless! Next, pour the dashi stock and let it come to a gentle boil. Cook for about 5-10 minutes until potatoes and carrots start to soften. Skim the oil off the top. Add curry roux and mix well. Start by using 2 blocks, but if you want a little richer curry flavor, add another block. Season with 1 tablespoon of soy sauce and 1 tablespoon of mirin. Adjust the taste by adding more soy sauce if you like. Let it simmer for another 5 minutes until vegetables are completely cooked and curry thickens. In the meantime, boil the eggs and cook the udon noodles according to the instructions. This can be done while you're waiting for curry to thicken. Now you are ready to break out the stone pot. Transfer some of the curry into the stone pot and let it come to a boil. Then add the cooked udon noodles, and turn off the heat. Place the sliced egg and green onions on top. Unless you hate green onions, I recommend adding a good amount, because it really enhances the flavor of the dish. 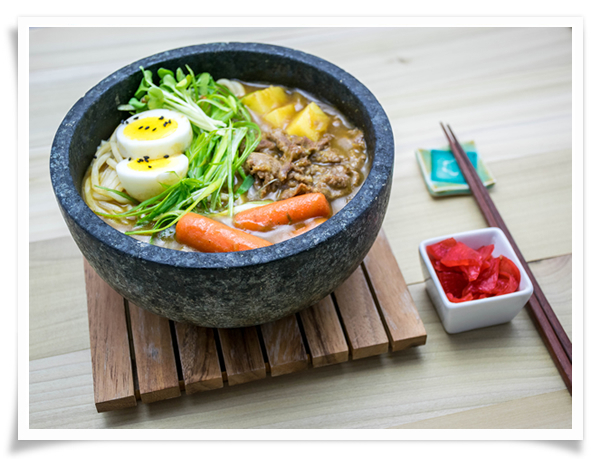 The reason why I like using a stone pot is because the dish stays hot all throughout the meal. If you don't have one, using a regular bowl is absolutely fine, it just doesn't stay piping hot the way stone pot does. The recipe makes about 2-3 servings. Doesn't my curry udon look yummy? Even my hubby, who is not a big fan of curry, loved it. It was tasty with pickled radish that I picked up at Marukai supermarket. It really felt like we were eating at Curry House... even better because we didn't have to drive anywhere. Always a good thing when you live in LA!